While cleaning the garage over the weekend I happened on a collection of jars I’d tucked away for future use. (Hey…It’s the future!) 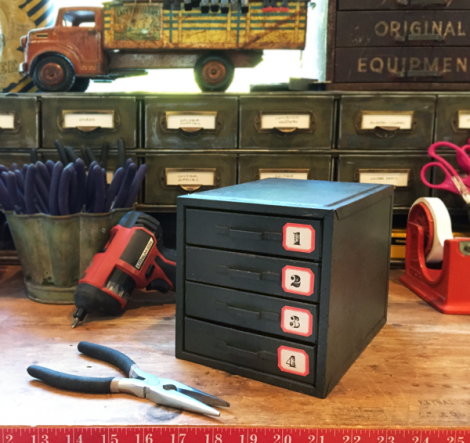 And I can always use more crafty storage in the studio. 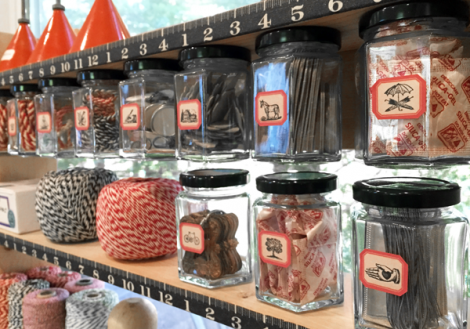 Jars work so perfectly to show off the stored contents. 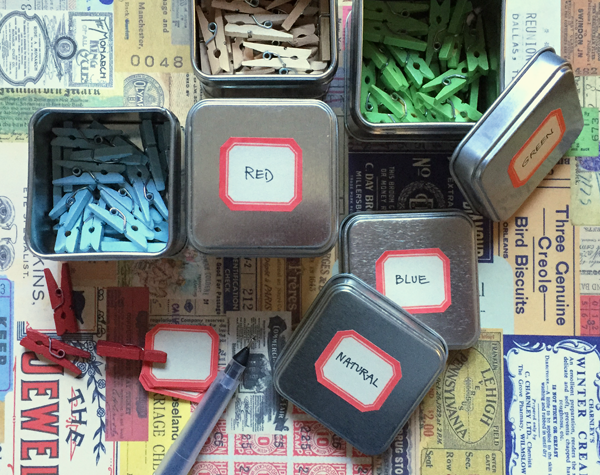 I find when I can see my supplies I’m much more apt to use them as I tend to forget some of the supplies and materials I have stored in drawers and boxes. I decided to attach into the dead space found on the underside of existing studio shelves. I simply drilled pilot holes into the lids, double-stick taped the lids into place under the shelves, then using short screws, attached them to the shelves. 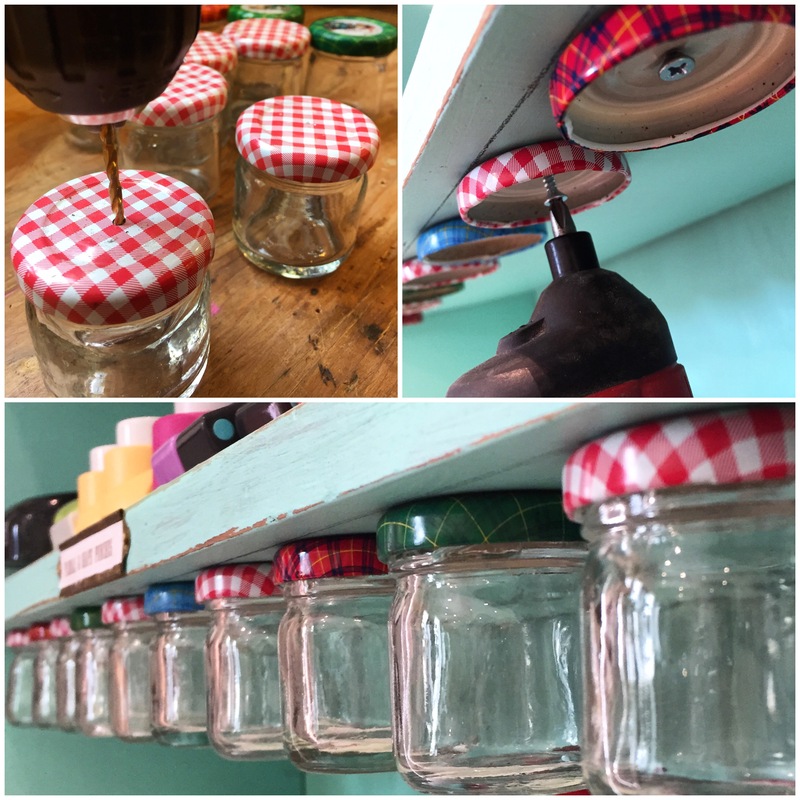 For larger lids & jars, I needed two screws and washers to keep the lids from turning when removing and replacing the jars. The jars were filled within minutes of installment. 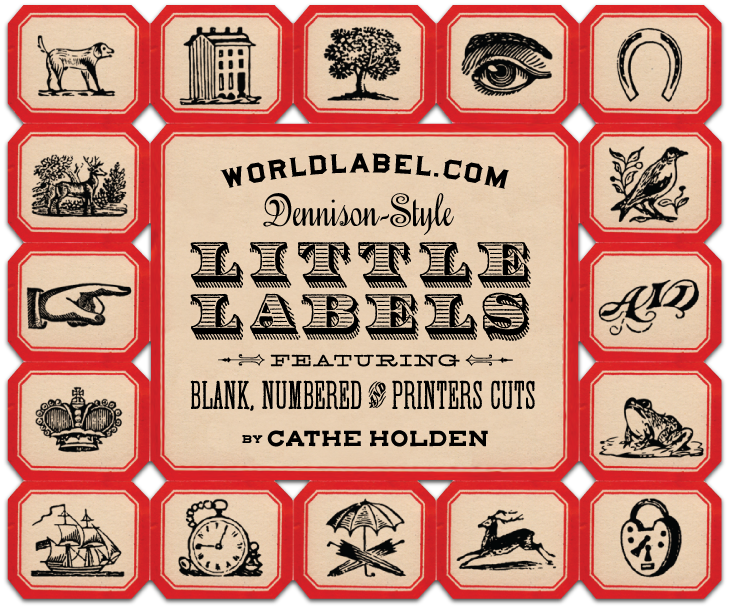 Also last weekend I designed a fun set of Dennison-Style little labels that are available to you as downloads for FREE courtesy of WorldLabel.com on their blog HERE. Download the PDF files, print to full sheet label stock from WorldLabel.com, trim out the individual labels (a good project in front of the TV), and use in a multiple of ways! I used the printer cuts set to decorate another set of shelf jars. Here are even more ideas. Have fun! This entry was posted in collage, craft storage, Free digital collage sheets, Free digital downloads, Free PDF files, free vintage art, organizing, Vintage blank labels, WorldLabel.com and tagged craft studio organizing, dennison labels, Free Labels. Bookmark the permalink. I love that storage, but now I need a shelf to hang them on. These are really cool. Thanks for the share! Thanks Cathe, just love these labels. So glad to see your blogging again, with the wonderful ideas and gifts to those of us who can’t attend your great workshops. Hey Cathe. I am glad you posted pics of before and after. They were great. Such a smart idea to use up space that would otherwise just be there. Thanks for sharing! I printed these Cathe, and love them! 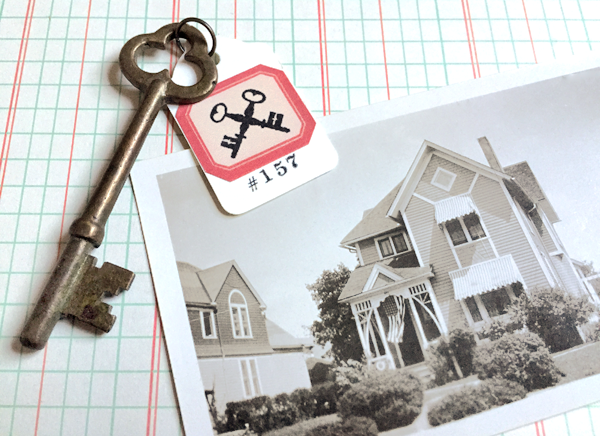 Such tiny labels, but they will be fun to use in my collages and traveler’s notebooks! Thank you for making them available for free. These are so great for organization and they are so fun! 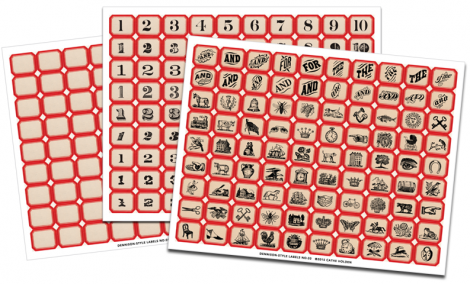 Is there a particular full size sticker sheet from Dennison you would recommend? 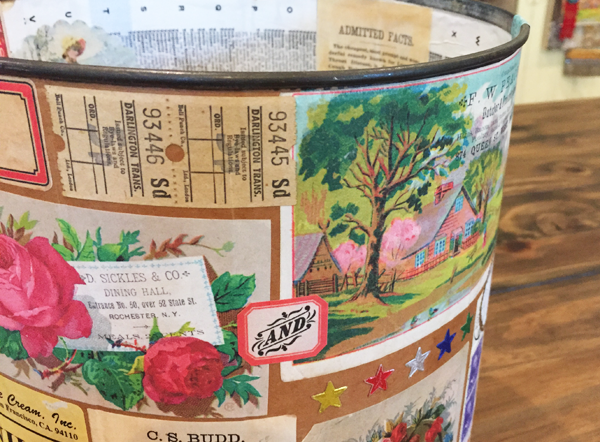 I have some original vintage Dennison labels that I have been using in my quilting studio. Hello! 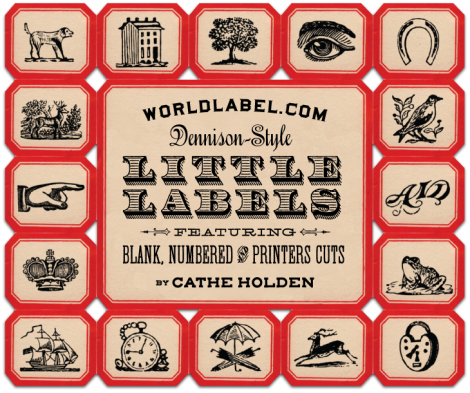 What happened to the world label blog and the vintage Printables. I was so happy to discover them recently and now they are gone?